The first ever surveyed census data by the Los Angeles Homeless Services Authority. See here for full article. Ocean Blue has recovered thousands of syringes from homeless encampments. These are the single largest risk factor in these projects. Ocean Blue personnel are trained in the safe-handling of syringes and sharps. These dangerously infectious needles are carefully retrieved with special long reach tools and puncture proof gloves. Once recovered they are immediately placed into a medical safety container for proper disposal. "[Regarding hypodermic Needles found at homeless camps] We once had local volunteers come out to help clean the homeless camps. The volunteer program quickly ended when one of the volunteers picked-up a bundle of trash and was poked by a potentially HIV-infected needle"
Citizens will often report the homelessness to the municipality; either joggers/bicyclists reporting the odors & unsightliness along bike paths, or home-owners reporting stolen bicycles and car break–ins. In turn with local municipalities, law enforcement and social services groups, we perform homeless encampment cleanups. At the time of writing, this year alone Ocean Blue has done over 300 homeless encampment cleanups within Southern California. Depending on the terrain, we utilize different cleanup strategies. Near the L.A. River, were the terrain is concrete, the homeless will reside underneath bridges. The river's embankments--sometimes rocky & steep--are layered in dirty clothing, syringes, broken bottles, food and paper wastes. 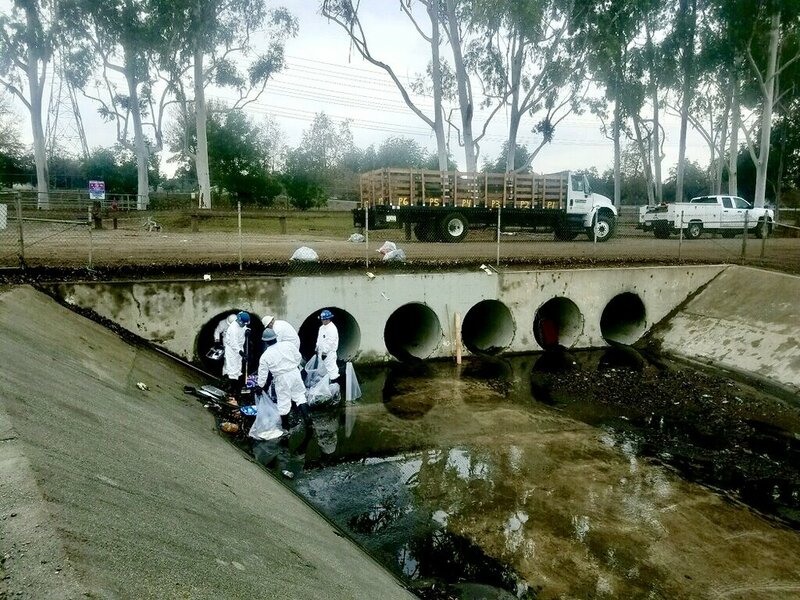 Technicians cleaning homeless garbage from underground storm drains. The Homeless crisis is a currently sensitive, hot-debated issue. Among burglaries, illegal drug proliferation and class-action lawsuits, municipalities are held accountable to their respective approach towards homelessness. However the local government presides, Ocean Blue caters its services to its client's needs. Whether we perform homeless encampment cleanings for the State, County, City or Private establishments, Ocean Blue understands different agencies wish to approach homelessness in a respective form & manner. 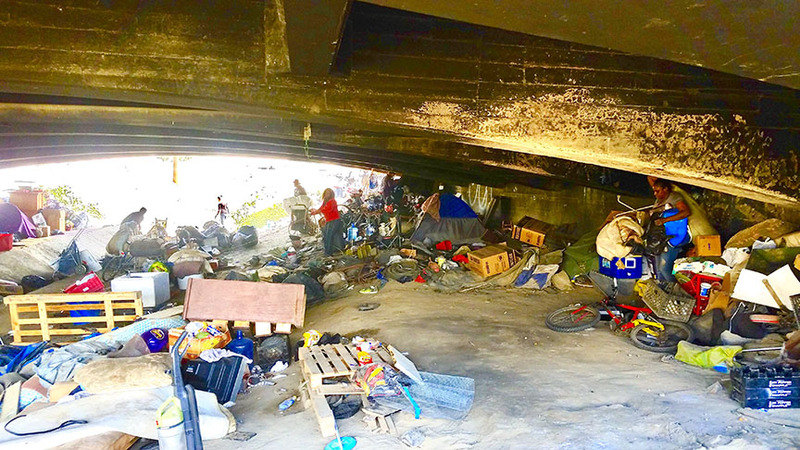 Whether it be to segregate "life-essential items", or using heavy equipment to quickly dispose loads of garbage, or waiting for Law-enforcement protection, Ocean Blue approaches each homeless encampment differently depending on the client's needs.